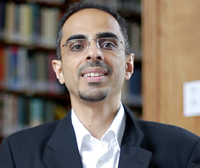 In the Winter Semester of 2013-14, LMU welcomes Yousef W. Meri as Allianz Visiting Professor for Islamic Studies. He is the eighth representative of the discipline to be selected for the post. The Allianz Visiting Professorships at LMU Munich were set by Allianz SE in 2003 with a view to promoting understanding and fostering dialog between Jewish and Islamic cultures. Professor Meri is a historian of religions, specializing in the history of Islamic religion and civilization during the Middle Ages. His particular interests center on the relationships between Muslims and Jews in this period, and on the comparative study of the significance of ritual in Islam and Judaism. He is also highly regarded as a leading scholar of the historical development of Islam in the Pre-Modern Period, focusing on themes in social and cultural history and on interfaith relations. Before taking up his present position, Yousef Meri was Academic Director of the Centre for the Study of Jewish-Muslim Relations in the Woolf Institute at Cambridge University. Professor Meri’s contributions to research have been concerned mainly with aspects of the changing fortunes of relations between Muslims and non-Muslims in the Middle East in medieval times. He has written extensively on pilgrimage and the veneration of saints, their shrines and relics in the religious cultures of the Middle East. During the current Winter Term, Professor is giving a course on “Pilgrimage in Medieval Syria” for M.A. students, which explores the topic on the basis of diverse types of texts pertaining to routes and sites of pilgrimage throughout Greater Syria. In next year’s Summer Semester, he will offer a similarly structured course, this time focusing on autobiographical writings by Muslim, Jewish and Christian authors. The Allianz Visiting Professorships in Islamic and Jewish Studies at LMU Munich was set up in the aftermath of the attacks in New York and Washington on 11. September 2001. The aim of the Endowed Chair is to foster intercultural dialog and further understanding of Islamic and Jewish culture. The primary motive for the initiative was the conviction that very many current international conflicts are exacerbated by an inadequate understanding of cultural differences. Professor Meri’s Inaugural Lecture takes place on 10. December at 19:15 in LMU‘s Main Building (Lecture Theater M 105), Geschwister-Scholl-Platz 1.